Medieval Daggers for sale include a wide variety of different styles. Designs in this category include battle ready functional daggers with high carbon steel blades and popular display pieces. Buy all types of medieval daggers on sale now. Brookhart Templar Daggers for sale are 18 inches in all. 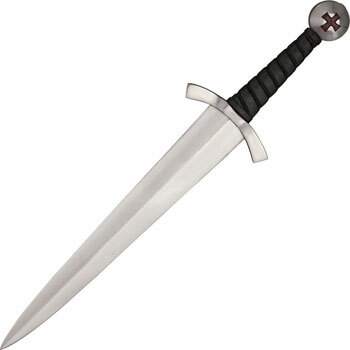 The Templar Dagger is made by Legacy Arms and features a hand forged 12 inch 5160 carbon steel blade. These full tang medieval daggers are hand tempered and sharpened. They feature the famous red cross in the rounded metal pommel. The 5 ½ inch wooden handle is comfortably contoured and wrapped in real black leather. The functional blade is securely peened into the pommel. These daggers feature a wooden core scabbard. The scabbard is covered in real brown leather and features brass accents on the tip. These medieval daggers are crafted in The Philippines and weigh around 1 pound 3 ounces. They are the companion dagger to the Brookhart Templar Swords. Buy the Brookhart Templar Daggers for $129.99.